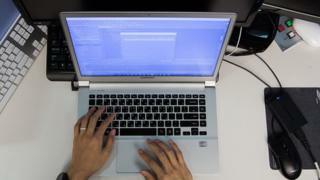 Russia has denounced the possible extradition by Finland of two Russian citizens to the US on cyber-crime charges. It says that the move is a violation of international law because the pair will receive "absurd punishments" of up to 100 years in jail. Finland confirmed the decision to extradite one of the men on Friday. Maxim Senakh is suspected by the US state of Minnesota of attacking servers to steal millions of dollars. It is unclear whether another computer fraud suspect named by Russia, Alexander Sergeyev, will be deported. Finland shares a 1,340km (833-mile) border with Russia, which has repeatedly warned it not to join or co-operate with Nato. In April the Finnish navy dropped depth charges in waters near Helsinki as a warning to a suspected submarine, which some media reports said was Russian. A Russian foreign ministry statement said Finland decided "a few days ago" to extradite both men. "We maintain our principled view that the practice of detaining Russian citizens following US requests to third countries all over the world is a legal abuse and violation of internationally recognised proceedings," it said. "We confirm our categorical objections to the extradition of the Russians to the USA. We hope that the Finnish authorities will take into account our position, which has been repeatedly explained to them." Finland, however, argues that its Justice Ministry's decision to deport Mr Senakh cannot be appealed against because the High Court decided in December to endorse his extradition. He was detained at the Finnish-Russian border in August while returning to Russia from a holiday. The Wall Street Journal reported that he is suspected of installing malicious software on servers to obtain millions of dollars in commission payments. Two of the servers were located in the state of Minnesota, the paper reported.